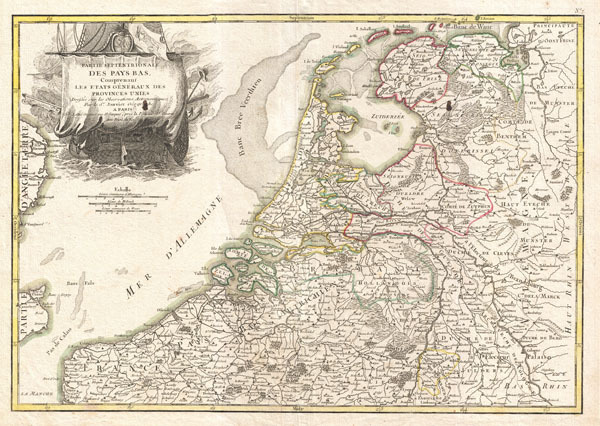 A beautiful example of Jan Janvier's decorative map of the Low Countries or Pays Bas. Covers modern day Holland and Belgium from Friesland south to France, west to England, and east to Germany. Offers excellent detail throughout showing mountains, rivers, forests, national boundaries, regional boundaries, forts, and cities. Offers some undersea detail. A large decorative title cartouche depicting a merchant ship appears in the upper left quadrant. Drawn by Jan Janvier around 1775 for issue as plate no. 7 in Jean Lattre's 1776 issue of the Atlas Moderne.